On this Veteran's Day, I'm thinking of my favorite veteran: my grandfather, Sam Maxwell. In his honor, I'll share one of his best "war stories". While stationed in the air force in England, he got bored one day, and this mountain boy from Western North Carolina decided to go hunt quail. He was using some high-powered military-issued gun, and it wasn't too long before the MPs showed up and escorted him to the commanding officer on base, who asked my grandfather what he'd been shooting at. My grandfather said, "Crows." (He knew it was illegal to shoot quail because they technically belonged to the local landed gentry, but coming from the US, where hunting on private property was an accepted form of grocery shopping, he thought the law was ridiculous and chose to ignore it.) The commanding officer, who was a country boy himself, handed him a .22 and said, "Here, son, use this. It don't make near as much racket." My grandfather loved telling this story and always laughed at that part. He was actually shooting the birds to take to a local farmer and his wife that he had befriended. The wife would always sweat out his missions, watching the sky to make sure his plane made it home. She made him a silk scarf and embroidered the city name for each of his missions on it. Meat was scarce, and he would often hunt for them and trade them for fresh eggs. One night he and some friends snuck into the mess hall after hours and cooked up some eggs, fried up some potatoes, and some rabbits they'd hunted. They were in the middle of their dinner when a superior walked in, all ready to catch them up to no good. He looked around, saw the food, grabbed a piece of rabbit meat, sat down to join them, and said, "Boys, any time you want to have a party, it's alright with me." I suppose this was one of the few happy times he had during that time. He talked about coming back one night from a mission to his barracks (for some reason he wasn't in the same barracks as the rest of his crew) and NO ONE came back. He only had a cat for company that night, that came in and slept with him. My grandfather HATED cats, but that night, he was grateful for the company. I don't think I ever fully appreciated what he went through in England until I was in high school and watched the movie Memphis Belle. My grandfather didn't know the crew of Memphis Belle personally, but they were stationed in England at the same time and flew many missions together. Many of the situations captured in the areal footage are situations my grandfather saw firsthand. 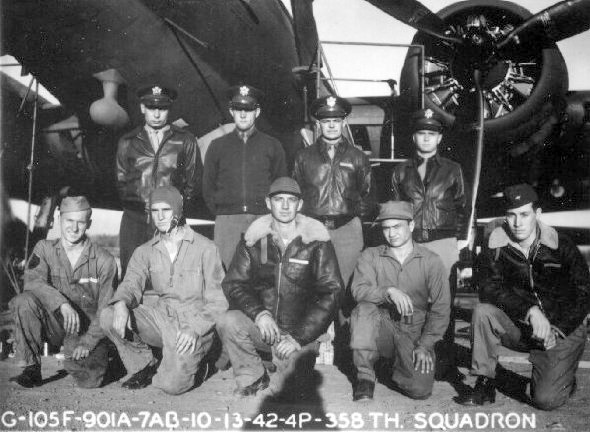 He was the right waist gunner on his B-17, so he had a front row seat in the theater of war. After I saw the movie, I called him and I asked him questions about what his own experiences were like for hours. He wasn't the most talkative person in the world, and never really talked about his experiences much. After this conversation, I never saw him in quite the same light. Because of his service to his country, he had prevented me from having to witness and experience the terrible things he did. In an odd twist of fate, when I was an exchange student in Hungary, my class took a trip to Devon for a week. I didn't remember (or know at the time) that this was the area where my grandfather had had his great adventure. But I was tootling around in these little shops and found a handcrafted pottery mug that I absolutely fell in love with and had to get. Years later, I thought to look up information about where the pottery was made. It turned out that it came from Newton Abbott--the little town my grandfather landed when he bailed out of his plane. Today, I honor him and all the servicemen and women who have sacrificed so much for this country.